Where do I use my Face Theory voucher code? FaceTheory is a new concept in the world of skincare and is the first in the business to offer a completely personal experience for the customer. Simply take the online skin quiz and FaceTheory will accurately guide the customer on which products are best for them based on their needs. The unique vegan and cruelty-free collection contain everything you need to care for your skin adequately including Moisturisers, Cleanser, Toners & Premiers as well as delicate face cloths. Dedicated to ensuring the customer comes first, the expert beauty specialists at FaceTheory have developed their very own unique collection which offers a variety of options for all skin types. A customer can choose between fragranced or un-fragranced Mandarin Extracts, UVA/UVB protection, Paraben-free pure skin chemistry including no toxic ingredients along with more benefits. At FaceTheory, their philosophy is to create great skin care at an even better price with products which are easy on the bank balance. You could make further savings shopping online using one of out NetVoucherCodes deals or discount codes which can save you further cash off your goods. FaceTheory are proud manufacturers of Vegan and cruelty-free products which paraben free and guarantee amazing result for your skin. The skincare collection combines a huge array of natural ingredients including Aloe Vera, Avocado, Glycolic Acid, Zinc Oxide and so many more which act together to create the perfect formulation for your skin. More ingredients include Hyaluronic Acid, Niacinamide, Retinol, Salicylic Acid and Vitamin C - this innovative and unique selection is what FaceTheory collection prides itself on and is why their loyal customers return each and every time they’re seeking a new facial product. As one of the only retailers on the market using Natural Remedies in each and every one of their products, you won’t find Face Cosmetics and Skincare quite like these anywhere else. 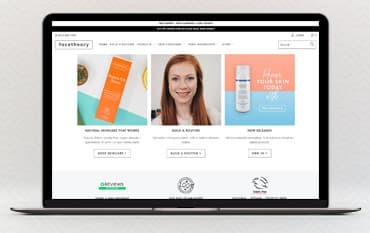 What’s more, using one of our money-saving deals which you can find right here on our deals page, you can make great savings when you shop online so filling your skincare routine with natural products doesn’t have to cost a fortune with FaceTheory. FaceTheory is a revolutionary skincare brand which delivers uniquely bespoke skincare routines - a first in the industry. FaceTheory is a unisex brand which uses strictly Vegan and Cruelty-Free products along with a combination of formulations and ingredients which guarantee results. Build your own routine online by answering some basic questions and FaceTheory will do the work for you making recommendations on what will work best for you. Shop the unique products online using one of our FaceTheory Voucher Codes and you make guaranteed savings when you buy online.